Change may be good, but I like that some things stay the same. Take the Converse All Star, for example. It’s an icon, a rock ‘n roll staple, a shoe I find myself wearing almost every weekend. 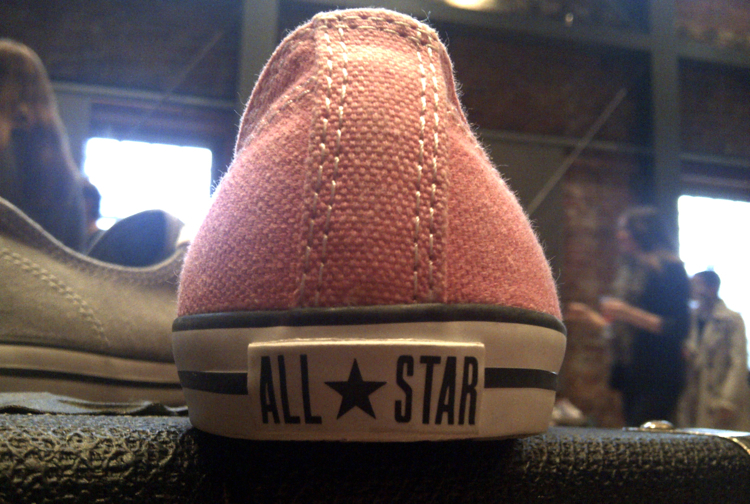 The other night, I stopped by the Converse spring preview at the stunningly beautiful Warehouse Studio in Gastown. My favourite of the new looks? As cool as the DC Comic collaborations are (just look at this kids’ shoe! ), I’d have to choose the Chuck Taylor Dainty for its slimmed-down take on the classic silhouette. It’s kind of the same, and kind of changed. P.S. Tweet like an all star. Follow @TheAnthology! I lived in Chucks for a few years, but I’ve recently had to give them up – they just fall apart on me too quickly now. Apparently this is a change other people have noticed too, since they moved production to China (and raised the price). Back when they were made right around here (seriously – suburb of Boston), it seemed like people could get more wear out of them. It’s a shame because they ARE an icon and I still love the way they look.